The Internet of Things has spread its wings far and wide in every industry. By enabling things to connect with the internet, the IoT technology has opened up businesses to scores of possibilities. From virtual assistants helping us every step of the way to wearable devices that track and analyze each step, the IoT is revolutionizing the opportunities we have as business persons which we can then pass on as benefits to our consumers. More so for the Retail sector. Retailers are now experimenting with IoT technology and analyzing its use cases for their unique buyers. Businesses are looking at the ways IoT can be used to revolutionize customer experience and develop a digital ecosystem. The Internet of Things is shaping a backward trend in the Retail sector. While some time ago, retailers thought e-commerce was their only way to make it big, they have now realized the physical shopping experience is also up for innovation. More and more retail businesses are now riding on virtual connectivity to create personalized shopping experiences, set up digital stores, and enable remote product interaction- completely changing the way buyers interact with a physical store. This trend has expanded the horizons of the Internet of Things for the retail space. in market share to smaller players who were fueled by digital transformation and innovation. Improved In-store Experiences – With the IoT technology, retailers are able to offer better in-store experiences to their customers. The Internet of Things provides a better opportunity for retailers to develop an improved ecosystem that connects their physical and online store- vastly improving the customer experience. This allows for a bi-directional flow of data and information, allowing for a better buying experience on both platforms. The smartphone becomes the hub of these interactions. The Beacon technology is also helping retailers interact with buyers as they enter their store. Sensors allow store managers to track the path of every customer after they enter the store to closely learn about their buying habits and behaviors. working in its warehouses all over the world. The company also plans to replace humans working on repetitive tasks with robots in the near future. For the retail sector, a robot workforce can do a lot. In stockrooms and warehouses, robots can free up employees from risky and dangerous tasks, such as fetching goods from high-up shelves. This would both reduce damage to goods in cases of accidents and prevent employees from getting injured. This would mean that employees can be shifted to more customer-facing roles that need their expertise. Robots can be used to maintain stocks and warn when the inventory gets below a threshold value. Personalized Buyer Journey – With the IoT comes a host of data. Data about the customer’s preferences, their buying behavior, their interests and favorite products to buy. This data can be leveraged to create personalized shopping experiences for all buyers. Frequently returning customers can be rewarded for their loyalty. Alternatively, IoT can be used to track what a customer has been looking for online, and when they are in the store, they can be offered the product at a discounted price. In a wrap, the Internet of Things comes with a wide variety of applications and required you to exercise your creativity and foresight to optimize its use. Smart Shelves – Your employees spend a lot of their time and energy in keeping track of stock and ensuring it doesn’t go out. Additionally, retailers have a need to predict future demand and manage their inventory accordingly. Smart shelves can help retailers automate both while also detecting theft. Smart shelves have weight sensors and RFID tags to scan products and inform you when items are running low or are incorrectly placed on the shelf. This makes inventory management precise and efficient. You can also save money on security cameras and personnel as RFID tags and readers detect in-store theft. Optimized Supply Chain Management – While retailers can gather information on products without the help of IoT technology, but it would be less efficient. The Internet of Things helps retailers obtain precise data such as how long a food item took in transit, the temperature at which an item is stored, and so on. Retailers and grocery stores can avoid loss by continually tracking these aspects of their product’s journey within and outside their store. IoT solutions, in essence, are helping retailers streamline operations, optimize resource usage, and increase revenue. Amazon Go is a wonderful example of how technology can shape buyer experience at a retail store. Recently, Amazon launched its long-awaited store in Seattle. Amazon Go merges technology and physical reality shaping a unique shopping experience. With a quick scan on the Amazon Go app, shoppers can choose what they want and leave without even halting to pay. Imagine walking into a retail store and getting a notification on your mobile device about a discount on the product you were wanting to get since long. Or, getting notified about the exact placement of the products you regularly buy. These are the instances that give us a glance into the future of retail. Since IoT solutions rely on Big Data, management and security of this sensitive buyer data is a challenge for retailers. While the data brings in insights and information retailers can use, it also amplifies the risk of getting the data compromised. On top of that, there is the need to partner with the right IoT app development company that can implement a customized IoT application for your business. Any lack in support from a trusted mobile app development partner can lead to a failed IoT project. Another challenge for retailers is the cost of setting up the infrastructure for IoT implementation. The solution for this is to start small- retailers can begin their IoT journey through a tiny use case such as using IoT to manage the temperature or lighting- applications that bring in immediate ROI. Data analysis and management requires expertise from proficient data scientists. Retail businesses can hire in-house experts who can help them analyze customer data or can partner with an IoT app development services provider who offers comprehensive services from one end to the other. IoT solutions need to be customized for each unique requirement. 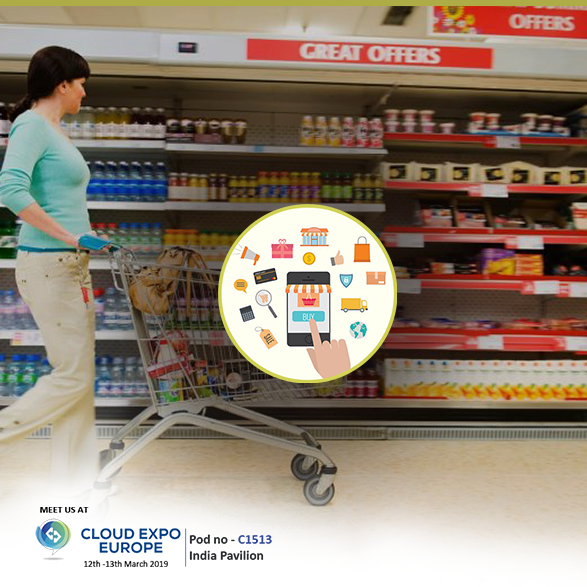 For the retail sector, this can be done by a mobile app development partner who knows the retail industry in and out. CDN Solutions Group is your ideal partner for IoT app development. With over 18 years of experience developing and deploying solutions in the retail industry all over the world, we assure the quality of software. We house a team of the most skilled developers, enthusiasts, and designers who can help you leverage the IoT technology to boost your revenue and business. We comprehend your requirements and aim to improve your key KPIs. Since every business is different, we develop custom solutions that answer your needs and blend in with your customers. If you want to meet our executives and discuss your digital transformation journey, see us at the Cloud Expo Europe 2019. We are an IT Company Debuting At The Cloud Expo London 2019, hoping to get our hands on more challenges in the retail space so we can define solutions for them.